WILD WESTERN WATER FOUNTAIN by Cascading Fountains home decor, jewelry, decor, decorations, electronics, fountains, floor mats, art glass, vases, garden essentials, fireplace screens. Who says that fountains have to be frilly? 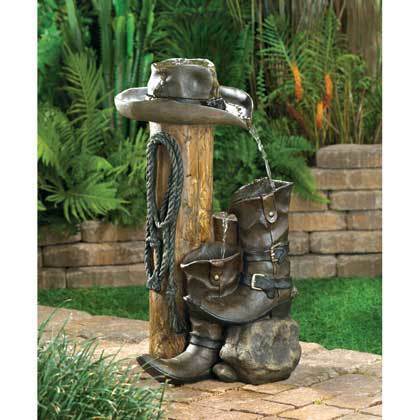 This ranch-style accent is loaded with authentic cowboy styling for a delightfully different take on garden decor. Real rustic weathered finish makes it an instant perfect fit for the great outdoors! Material(s): POLYRESIN. Weight 12.2 pounds. Dimensions 14" x 9.25" x 22.5".